Be the first to share your favorite memory, photo or story of Kurt. This memorial page is dedicated for family, friends and future generations to celebrate the life of their loved one. 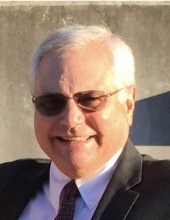 Kurt Steven Matlock, age 65, of Cedar Bluff, VA passed away Saturday, February 2, 2019 at his home. He was a member of the Grace United Methodist Church at Pen Argyl, PA. He graduated Pen Argyl High School Class of 1971 and was a graduate of Bloomsburg University in 1975 with a Bachelor of Science Degree in Business Administration. He also attended George Mason University. Kurt was employed by the General Accounting Office of the United States Government from 1975 until 1985. He retired in June, 2018 from Tadano Mantis Crane Corporation in Richlands, VA as Material Planner and Production Control Supervisor. He was preceded in death by his father, Drew Matlock, Jr. and an infant sister, Brenda Matlock. Those left to cherish his memory include his mother, Sharon Matlock of Elizabethtown, PA; his wife of 6 years, Faren Roark Matlock; one step-daughter, Farrah Roark of Cedar Bluff, VA. The family will receive friends from 6 – 8 p.m. Wednesday, February 6, 2019 at Singleton Funeral Service in Cedar Bluff, VA.
A Memorial Service will be conducted at 1 p.m. Saturday, February 9, 2019 at the Ruggiero Funeral Home in Pen Argyl, PA. The family will receive friends from 11- 1 p.m. prior to the Memorial Service. The family of Kurt Steven Matlock is in the care of Singleton Funeral Service in Cedar Bluff, VA.
To send flowers or a remembrance gift to the family of Kurt Steven Matlock, please visit our Tribute Store. "Email Address" would like to share the life celebration of Kurt Steven Matlock. Click on the "link" to go to share a favorite memory or leave a condolence message for the family.